This tutorial assumes that you have taken up a course on basic electronic circuits. It would help if you know how to write a spice netlist but its not a necessity. I wouldn’t be able to write this on my own without the right documentation. So here is the stuff I referred to learn myself. If you have already used similar software before, you could just jump to the documentation directly and skip the tutorial. Now save this file to ~/.gEDA/ with the filename gschemrc. If this file already exists, then just copy and paste the above lines to that file itself. Before you begin with any project, you have to decide on a directory structure. Here’s how we’ll organize our work for this tutorial. Create a directory and name it projects. In this create another directory called models. We will store all our SPICE models here. We’ll see what SPICE models are later. All examples in the SPICE tutorials are available for download. Check the sidebar on the right. There is a file called gEDA-examples-1.0.zip. Ignore the two boxes (SPICE model and SPICE directive for now). For this example, create a directory called diode-vi inside the projects directory. We’ll save our schematic here. refdes: A reference designator. This is a unique name that tells the simulation program what kind of component we have placed. 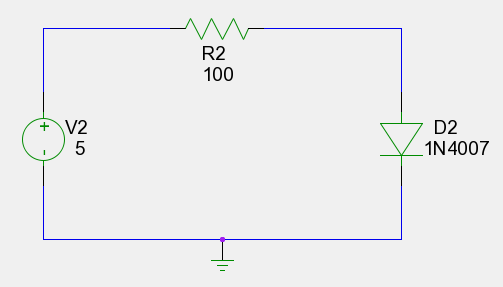 A refdes starting with R tells the simulator that the component is a resistor while a refdes starting with V tells the simulator that it is a voltage source. 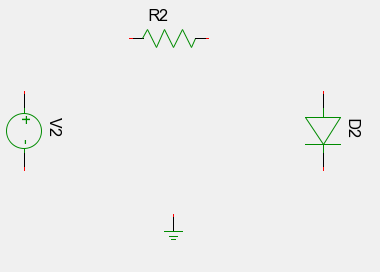 Similarly Capacitors are represented by C and Diodes by D. You can see the entire list on any reference on SPICE like the ngspice manual (check the prerequisites section). value: this tells the simulator the resistance of the resistor, the output voltage of the voltage source etc. It is a number which can be optionally followed by a multiplier character (like K for kilo, M for mega). We’re almost done with the schematic capture (i.e. defining the circuit). We need to now define the diodes characteristics. For this, right-click, select Add Component and go to the SPICE simulation elements section. In this, select and place spice-model-1.sym and spice-directive-1.sym. Close the Select Component Box. Double click on SPICE model and set model-name to 1N4007. Its already on the list so to set it, click the value column for model-name for the table, enter 1N4007 and press Enter. Next select file and set it to ../models/1N4007.mod. We’ll see what this file is later. 60 Responses to Circuit Simulation in GNU/Linux – Lets begin! Is this similar to multisim??? I would say that its similar to PSpice. I don’t know if multisim uses SPICE in the background to simulate circuits. Thanks man. Hey do you know of any programs that can synthesize Verilog/VHDL code? Hey why dont u make sure your tutorials are also available in PDF format!!! Because a blog can be seen and shared more easily. If people discover it they just need to visit it. If they get the PDF through mail from someone, they’ll not know when knew tutorials are posted because the person who e-mailed may not do so again. Secondly, PDFs take memory. I have limit to how much I can store online. I want to use ngspice through windows XP OS. Can you please guide me for useful things? There is a binary available here http://sourceforge.net/projects/ngspice-bin/. However, it won’t be of much use if you need a schematic editor. This is just the simulator program. However, if you have the netlist and need just a simulator, then I think it should be fine. This contains all the EDA software plus gives you the latest updates. Plus it is maintained by people who work in the electronics and semiconductor industry. Thanks for the great post. It is very useful. I was able to get started on basic ckt simulation within 10 min of reading your tutorial. Installation was smooth over 12.04 LTS ubuntu via ubuntu software centre. And after that your instrucations were exact. However now I want to try ADMS with ngspice for verilog AMS simulator. http://ngspice.sourceforge.net/adms.html And I am not able to install it. I filed a thread in ubuntu forums and wanted to know if you have tried or you know any solution for the same. I also mailed the developer of ADMS. No I haven’t tired ADMS (heard about it for the first time from you). It looks interesting so I will give it a shot this weekend and see if I can install it. However, I use Fedora on my computer so I won’t be able to check this on Ubuntu. I’m hoping it shouldn’t make much of a difference. Yeah sounds good !! I am assuming that you are based out of Banglaore. Even I am based out of bangalore. Please send me your email id so that if require we can take conversation off-line from this blog. I saw that you were able to go through this step but couldn’t use admsXml. The error says that the program cannot find libadmsElement.so.0. The file should be located in /usr/local/lib. Can you check this and let me know? Probably a reboot was required. I am going to explore ADMS now and see how is it ? one slightly non related question. I am looking for across Process ( strong/weak or fast/slow ) models for some industry standard technology. It need not be very high end. I will be ok with 0.18u or 0.35u technology. Do you have any idea where i can find them ? Mosis does not seem to have fast/slow models they only have models for one nmos one pmos for different process flavors. I haven’t used technology files yet so have no idea about this 😦 Sorry about that. i am currently working with window 7(64bit)… i am having a live DVD of Fedora Electronic Lab 17…as a beginner with this project i am feeling uncomfortable with the live DVD ….want to install this OS on my laptop along with win7 without loosing any preloaded data on my hard disk….i am currently having 170GB of free memory on C:/ drive…would it be enough for installing this OS…. can you plz guide me for the installation…i shall be very thankful to you for this…. Unfortunately, I have never tried to install Fedora with your kind of configuration. I have a separate hard disk for Fedora and another one for Windows 7. Normally, you’ll need to create a new partition on your computer and then install Fedora on that. Alternatively you could use virtualbox and install Fedora on a virtual machine. can i repartition the c: / drive without any data loss? Yes it’s possible. Right click on My Computer. Select Manage. On the left hand side, select Disk Management. Right click on C: drive and select shrink. You can then create a new partition by setting the size in the dialog box which appears. however I have not tried using this with ngspice. I am sure either it will work directly or it will work with some modifications. If you get it working please post here so others can take it forward from you. Mind you this is only nominal data and you don’t have across PVT (process , voltage, Temperature) data. And if you find across process data please share a link. I’ll try to check this out later today. i am having some BSIM model files for 180nm,130nm,45nm 22nm etc..can mail you if required in the evening…. Can you please mail it to modi[dot]samarth[at]gmail[dot]com ? the tech. files i sent….was that working for you? I haven’t got time to check it out. They anyway did not look like across PVT corner. I doubt if I will get any time in near future also to check as I am held up in something else. i am not having that right now….can mail u within 8 hours…. Thanks for the nice tutorial! – I just happen to find it while searching for a simulation tutorial (exactly what KiCAD is missing 😦 ). comes back with an error ‘unbound variable’. I could get the autonumbering through a menu option. which will number everything starting from 1 instead of 2 in your tutorial. In case someone hits the same snags. I’m not sure I understood what problem you are facing. My gschemrc still works. Is this a newer version of gschem? I don’t know. I only know that the elements were not numbered, contrary to what the script was supposed to do, automatically. Connect a voltage source in series with the component you’re interested in and set the value of the voltage source to zero. 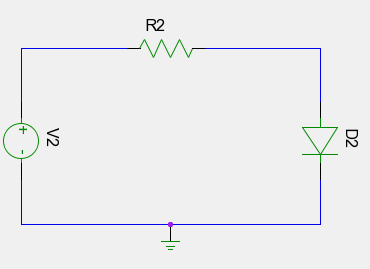 Ngspice calculated the current leaving the positive terminal of a voltage source. So the only way to get the current through a component (say a diode) is to put a voltage source in series with it. But you don’t want this voltage source to affect your circuit. Therefore you set the value of this “dummy” voltage source to zero. I am beginner in Mixed signal circuit design world and found that Gspice and gschem are the best free tools available to do some projects by myself. I am trying to use Nmos and Pmos from ASIC componets in gschem add component window, do you know what voltages are they made to operate on? I have a project which has vdd specification of 1.8v, so can you point me to the active devices i can use? this would a great help. I’m not sure what devices you can use (I have almost no experience in mixed signal design. I wrote these tutorials to help a few of my friends who had problems using it). What I do know is that you need to download SPICE models from a manufacturer (Fairchild & TI/National Semiconductors have SPICE models on their website). These will be discrete components so they may not help for ASIC design. What I would suggest is looking at http://www.mosis.com. They provide technology files for free. This should help you get the SPICE models you need. Typically model files will have maximum ratings. 0.18u in TSMC will definitely have 1.8V transisitors. if you copy paste you model here I can probably look it up and see what is its voltage ratings. A good simulator(along with a model) will also give warnings that you have exceeded its rated voltage. No I haven’t. I do have it installed and do plan to learn how to use it some time next year. I’ve read it’s quite good. My browser somehow doesn’t show a link to your gEDA-examples-1.0.zip in any sidebar that I can see. Could you please clarify or post a link in a comment? Thanks. Pingback: Debian GNU/Linux Wheezy packages | Freedom, World peace in unity! This was tremendously helpful in getting started. Thanks for posting. Gwave doesn’t work on Ubuntu (seg faults all the time) and isn’t on the Fedora repos either. These tutorials are actually quite old and I wrote them while I was learning ngspice. There are two features in ngspice’s built-in plotter that I didn’t know of back then. (1) You can click on the waveform to know its value. 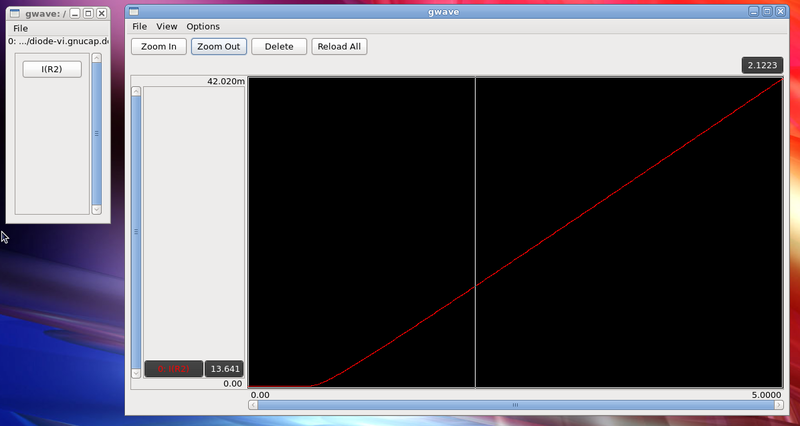 (2) You can left click and drag to find the curve’s derivative. I should write an update to these tutorials when (or rather if) I get time. gaw looks wonderful!! Thanks a lot. I am more interested in the s-parameters and the high frequency analysis and was just starting off with spice. I used a popular pspice based simulation program in windows( I think u know which :D), but then came across your blog and came to know the power of spice and thought could simulate our own circuits. Keep blogging man !! You are really helping a lot of people all over the world!! Found your tutorial but cannot find the examples file. Tried the links but none of them work. As one of the comments stated, you should have put the link in the article. Can you not link it in your comments? Thank you. For some reason, my Firefox privacy settings didn’t allow box.com to display any files at all. I thought it was out dated. I had to use a less secure browser to get them.